Prune Spice Cake is a name I avoid using because the word "prune" puts so many people off. Unless you enjoy imploring your picky eater to "Just try it, you'll like it," I'd suggest you call it Spice Cake and skip all that nonsense. I first came up with this cake when I was a teenager. Over the years, I tinkered with it until I settled on this formula. If I hadn't needed a frosted cake for a particular reason this week, I would have skipped the frosting and just served it with some barely sweetened whipped cream. 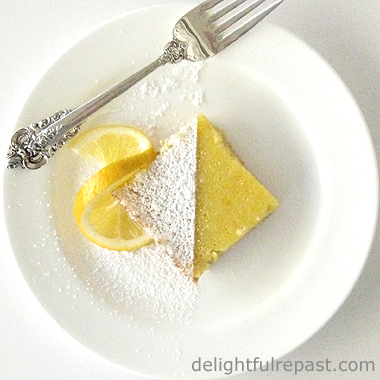 It's a lovely moist and tender cake that keeps well at room temperature for a few days or even freezes well. I needed to cook a week ahead for an upcoming lunch for friends, so sliced half the layer cake into six slices and laid them on a parchment-lined, indispensable 13x9x1-inch quarter sheet pan, covered it with foil and popped it into the freezer. What size/shape cake do you make most often? I have all sorts of pans: 6-, 7-, 8-, 9-, 10-, 12- and 14-inch rounds, 8- and 11-inch squares, not to mention the rectangles and loaf pans; but I make a 7-inch round cake most often these days. 1 Spray one 13x9x2-inch pan with organic* canola cooking spray, or butter and flour two 8-inch round layer pans. * Of course, I use organic everything, but I mention it specifically for the canola oil because canola oil that is not organic is sure to be genetically modified (GMO or GE). 2 In 1-quart saucepan, combine prunes and water. Cover and simmer about 20 minutes. Drain, reserving 2/3 cup of the liquid (add water if necessary). Chop prunes. They wind up a rough puree. You could use the food processor to make a perfectly smooth puree. Preheat oven to 350F/180C. 3 In 2-cup glass measure, microwave butter until just melted. Stir in oil. 4 In bowl of stand mixer, combine all the dry ingredients and mix on low speed for one minute. Add reserved prune liquid and the butter and oil. Mix to blend; at medium speed, beat for 2 minutes. Add eggs. Mix to blend; beat for 1 minute. Stir in prunes and walnuts. 5 Pour into prepared pan(s). Bake at 350F/180C for about 40 minutes (single) or about 30 minutes (layers). 6 Serve single cake directly from pan. For layer cake, cool in pans on wire rack for 10 minutes. Remove from pans and cool on wire racks for an hour or more. When completely cooled, frost with vanilla butter frosting. Looks and the recipe sounds very much like what me dear ol’ mum used to make. It’s delicious, but…but forgo the frosting. I think not! Frosting, frosting, frosting. In fact, you could add another layer of that…say, an inch or two. (And let me lick out the bowl afterward…). Sully, can't believe my little picky eater likes a prune cake! Glad to hear it. You've made my day! 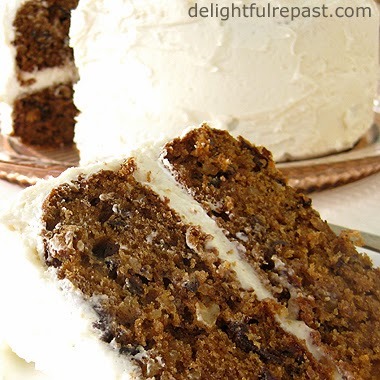 Spice cake sounds like a boring brown cake that someone I know makes but Prune Spice Cake sounds deliciously rich and decadent. Definitely with the icing. Thanks, Anne! Glad to find another fan of the prune! I'm sure they will, Greg! :D I forgot about my various springform pans. I use the 7- and 9-inch ones most. I actually love the prunes and all the winter spices of course :-) The cake looks right up my alley, Jean. Thanks, Angie. Of course *you* like prunes--you're a sensible woman like me! How about Spiced Plumb Cake. Looks delicious. I'll file the recipe away for my next sweet adventure! Richard, didn't the prune industry try that several years ago -- tried to switch over to dried plums? What ever happened with that? Guess it didn't take off. Let me know how the cake turns out for you! I'm not sure about the Plumb/Prune campaign. I think the jury is still out on that one. Where I live, Healdsburg use to be called "The Buckle of the Prune Belt" before wine grapes became the crop of choice. Interesting, Richard. I had no idea Healdsburg had a prune history. I actually do like cooking with prunes, and my youngest teen will just eat them straight. I don't know how they got such a bad name. Your cake looks delicious, Jean...sending some foodie love your way! Thanks so much, Michelle! I'd rather eat them than chocolates! This sounds delicious. My great aunt Lucy was famous for her prune platter every holiday dinner! Hmmm, I've not been a big fan of 'plumbs' in the past but it's been years since I tried them last... looks like this cake would be a good reason to try them again! I've never cooked with prunes. But my mother always had me keep them on hand when she would visit my house for a few days.....not for cooking, however. Cat Tales, thanks! Have you blogged about that prune platter? I'm curious about that! Yes, Jacqueline, give this cake a try. I'm sure you and GS will love it! :D Linda! You would like them, I'm sure, in cake and cookies. I like your judicial naming of this ;) It sounds delicious - my sort of cake, for sure! Kari, thanks, I hope you'll try it soon! The title, Prune Spice Cake does bring associations with it, Jean. I remember my mother, when my two brothers and I were not into our teens, tried to get us to eat prunes and we did , occasionally. However, I haven't eaten them for years. I must admit the title Spice Cake might entice me more than your official title, Jean. By the way,I like the family tales and personal experiences you attach to many of your recipes. They make your recipes unique. Thanks, Tony. It's hard for me, but I try to put in my personal experiences once in a while; glad you like them. Charlie (Spiced), I guess you would love spices! Thanks so much! I like prunes, so I'll call it Prune Cake. I went through a long phase of very little cake baking or cake eating, but lately I have fallen in love with cake again. Aren't cakes so cheerful? Thank you for the recipe, good cook! Karen, thank you! I'm so glad you like the recipe. Let me know how it turns out for you. April, thank you so much! Yes, I felt certain that one or two of my guests the other day would've balked at Prune Cake, so I waited till they had declared it wonderful to tell them about the prunes! Jean, the prunes must provide terrific body and moisture to the crumb, and I can see where they almost play a supporting role to the spice. I seem to navigate to 8-inch rounds as my "go to". 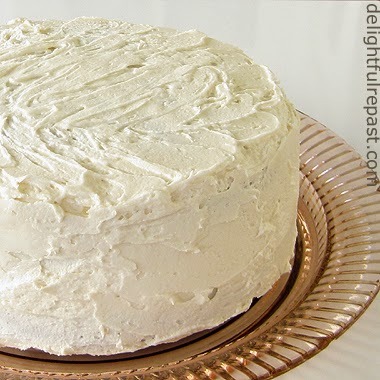 Whether with frosting or a nice dollop of unsweetened whipped cream, I'd love a slice, please. Thanks so much, Brooks! Yes, exactly; the prunes just disappear into the cake, providing lots of moisture and a backdrop for the spices. Ha! I wonder if prunes will ever get over their bad image! I'm sure the cake is absolutely delicious and definitely approve of your slight name change. Thanks, Pauline. I don't know how something so tasty as prunes got such a bad image in the first place! Thanks, Chel. It's just a basic 1-pound-of-powdered-sugar American vanilla buttercream, with heavy cream as the liquid. Thank you for popping over to my blog, your cake looks fantastic! Thanks, Candy Pop! And it goes great with a cup of tea, which I know you appreciate! I love prunes, but some have a prejudice associated with that word, so you might want to call it plum spice cake. Doesn't that sound lovely?! Rebecca, that's a grand idea! This cake will henceforth be known as Plum Spice Cake!